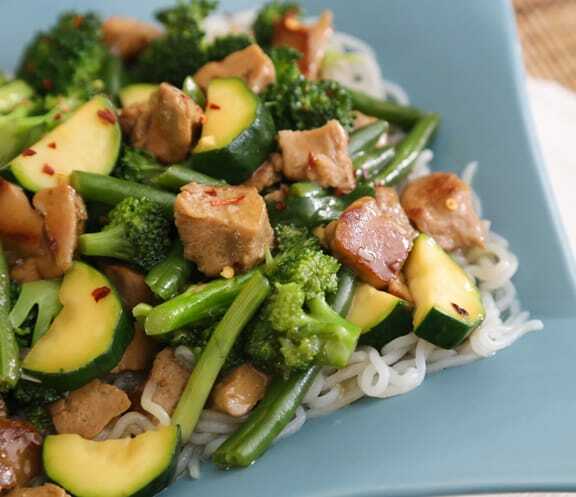 This very green stir-fry, inspired by the dish of the same name served in western Chinese restaurants, is especially good to make when slender green beans are in season. 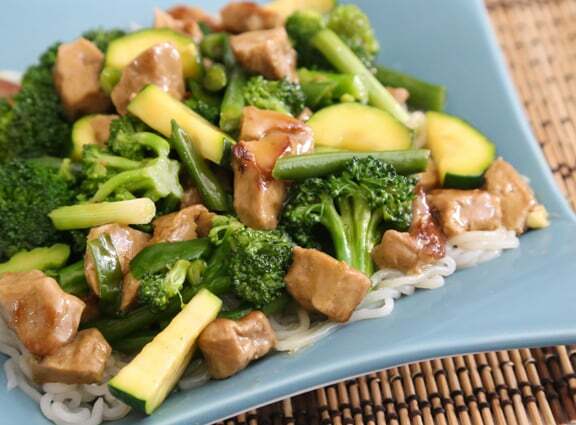 “Triple Jade” refers to the three green veggies used — green beans, broccoli, and zucchini. Serve over hot cooked rice or noodles, or on its own. Photos by Evan Atlas. For the sauce, combine the cornstarch or arrowroot in a small bowl or with just enough water to dissolve it. Add the remaining sauce ingredients, stir together, and set aside. If using seitan, cut into bite-sized pieces. If using tofu, cut into 1/2-inch thick slices. Blot well between clean tea-towels or several layers of paper towel (or use a tofu press ahead of time if you like it really firm), and cut into dice. Heat half of the oil in a stir-fry pan. Add the tofu or seitan and stir-fry over medium-high heat until golden on most sides. Remove from the pan and set aside. Heat the remaining oil in the same pan. Add the garlic, green beans, and 1/4 cup water. Cook over high heat, covered, for 3 minutes, then stir in the broccoli. Cover and cook until the beans and broccoli are brightly colored and just tender-crisp, lifting the lid to stir once or twice. Add the zucchini and scallion. 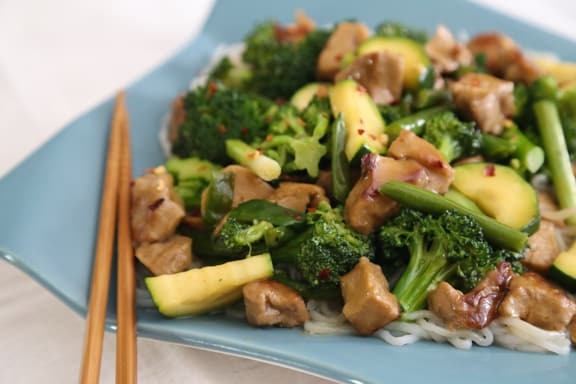 Stir-fry for another 2 to 3 minutes, or until all the vegetables are tender-crisp. Stir in the tofu or seitan. Pour in the sauce, and cook, stirring, until it has thickened, another minute or so. Serve at once. If fresh green beans are not in season, use organic whole frozen green beans, thawed. Add the green beans and broccoli to the span at the same time.